Does time have a color? It certainly does. And for director Hayao Miyazaki, the color of time has been an important element of animation throughout his career. For nighttime scenes in particular, the Studio Ghibli animator and his staff have gone to great, painstaking lengths to maintain a sense of translucence and to illustrate darkness without literally darkening the screen. This and several other uses of color are part of a new exhibition opening at the Ghibli Museum in Tokyo. Titled Eiga wo Nuru Shigoto (literally "The Work of Coloring Movies"), the new exhibition opens November 17, 2018 and is the first new exhibition since last year. 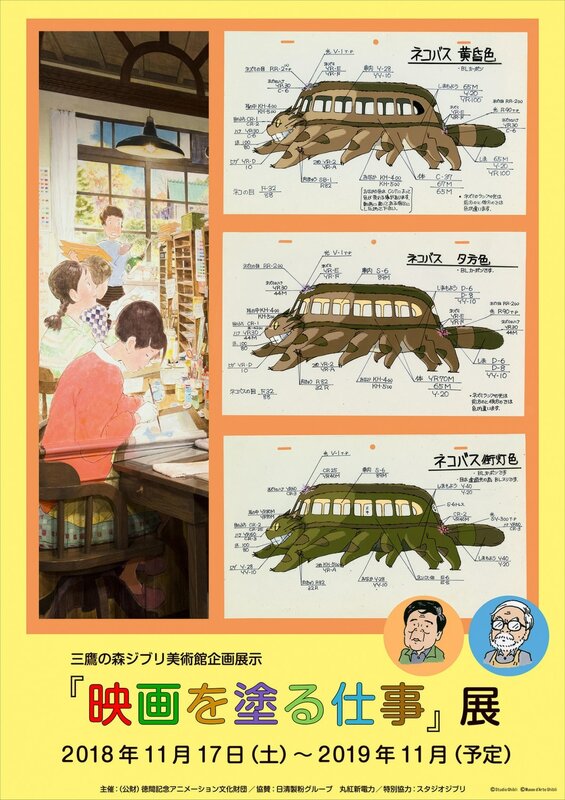 Using My Neighbor Totoro as an example, one section of the exhibition will be dedicated to how illustrators have used color to depict the passage of time. What’s particularly enlightening are the three different versions of the cat bus that were created, each for a different time of evening. And the names for each color palette are particularly delightful: dusk, evening and streetlamp. Learn more about this exciting new exhibit in the original article from our friends at Spoon & Tamago via the link below!